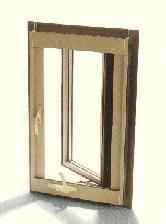 The Columbia Series 3400 Aluminum windows are designed for today’s special new construction or replacement applications. The frames are fully compatible with Series 3000 Double Hung, 3100 Sliding, 3200 Picture, and Series 3220 Circle Top windows, allowing stack mulling or side-by-side mulling to accomplish complete flexibility and versatility in special design requirements. The Columbia Series 3400 aluminum window is a high quality affordable choice for new construction or replacement windows. Material: Frame and sash shall be integral thermal-break insulated aluminum of 6063-T5 alloy having a minimum thickness of .062″, within commercial tolerances. Integral fins to have suitable break-off and nailing grooves. Finish: Aluminum windows to be finished in bronze or white electrostatically applied enamel finish with optional solid beige or white vinyl cladding on all interior surfaces. Weatherstripping: Sash shall have two rows of high-performance weather seal consisting of dual durometer elastomeric TPE skin over closed cell foam. Weatherstripping shall provide easy break-a-way performance under all temperature variations without wicking or compression set. Skin shall be puncture and tear resistant with no air pockets.